A group of Russian and American aviation enthusiasts flying Second World War-era aircraft retraced the historic Alaska-Siberia air route used to ferry American warplanes to the USSR under Lend-Lease, arriving in Fairbanks, Alaska over the weekend. A pair of their aircraft is set to fly on to Moscow via Siberia. The city of Fairbanks historically served as the checkpoint where American pilots would hand US-built fighters, bombers and transport planes over to their Soviet counterparts, who would then fly them to the Siberian city of Krasnoyarsk, from where the planes would get distributed to the front lines. Between 1942 and 1945, nearly 8,000 aircraft were sent to the Soviet Union via the 9,700 km Alaska-Siberia air route. This year, aviation enthusiasts decided to retrace the steps of the historic air route to celebrate the 70th anniversary of the end of the Second World War. The event, dubbed Alaska-Siberia 2015, kicked off in Great Falls, Montana earlier this month. It was organized in cooperation with the Russian aviation company Rusavia, Wargaming.net, and the US non-profit Bravo 369 Flight Foundation. The foundation is filming the event, and plans on releasing a documentary about the harrowing routeand its recreation, which will be called 'Warplanes to Siberia'. Spectators in Fairbanks were given a real treat on Friday as two Douglas C-47 transport aircraft and a North American T-6 Texan advanced trainer touched down at the East Ramp of Fairbanks' International Airport. Enthusiasts were invited to come and see the historic aircraft on the tarmac. 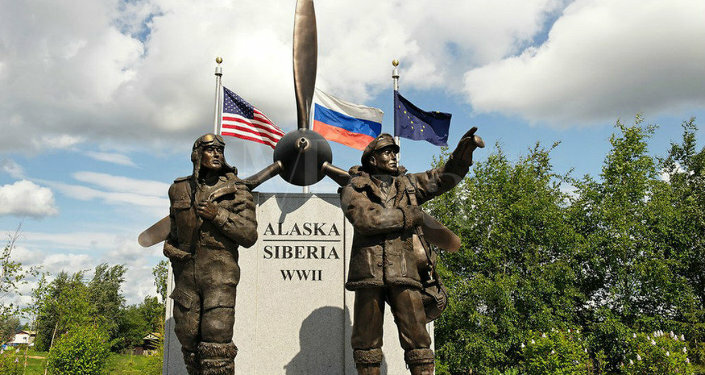 On Saturday afternoon, the Russian and American flight crews went on to make the ceremonial hand-off at the Lend-Lease Monument in downtown Fairbanks, in an event which was attended by city officials, Rusavia director Sergei Baranov, numerous guests, and residents of the city of Fairbanks. The ceremony featured an exchange of flags, which will be delivered via Krasnoyarsk to Moscow and then on to the respective countries' embassies in Moscow and Washington, serving to memorialize the friendly relations between the two allies during the Second World War. Bravo 369 cofounder Craig Lang told Russia's RIA Novosti that at the ceremony, "we said a few words about the [wartime] cooperation and friendship between Russia, Canada and the United States, shook hands with our Russian colleagues and wished them luck on their way to Moscow. They answered in the traditional Russian greeting 'Hurrah!' I don't know how to translate this exactly, but they too wished us lots of luck." The Lend-Lease monument in Fairbanks was created by famous Alaskan sculptor Richard Wallen. Opened in the summer of 2006, it features two pilots –one Soviet and one American, looking confidently toward the sky. Kicking off in Great Falls, Montana earlier this month, the pair of Douglas C-47s making the trip were purchased by Rusavia to become part of a permanent museum exhibition in Russia. The aircraft were accompanied by Bravo 369's T-6 Texan to Fairbanks. On Sunday morning, they continued on to Nome, before crossing the Bering Strait and into Russia. Flying through Siberia, they will arrive in Krasnoyarsk on August 4th. From there, the planes will continue on to Moscow, ending up at the MAKS-2015 aviation show, set to open August 25th. For their part, Lang and Bravo 369 president Jeff Geer will now fly their T-6 Texan back to Washington, but they told Russian media that they hope that they too will be able to attend MAKS-2015. Speaking to Alaskan media about the event, Lang commented that "after flying the route, you have a whole new appreciation for what these people did during the Second World War. They did not have the survival gear that we have, they did not have the modern avionics that we have or the creature comfort of most of the stops." The pilot noted that the historic ALSIB route continues to have great significance for many Russians and Americans, and that the Soviet-American partnership of the war era is something worth remembering for future generations. As Bravo 369's website explains, the ALSIB route was marked with extreme danger. Pilots faced treacherous conditions, extreme cold (as low as —60 degrees Celsius), and other problems. On the American side, ferry pilots often had as little as 40 hours of flight time, forcing them to fly in groups along with more experienced pilots. A total of 177 aircraft flying along the harrowing route never made it to the front lines. The route was also long-classified top secret due to the Soviet Union's neutrality agreement with Japan for most of the war. The ALSIB route was established a year after US President Franklin Roosevelt extended the Lend-Lease wartime assistance program to the Soviet Union. Among the nearly 8,000 aircraft sent to the Soviet Union via the Great Falls, Montana-Krasnoyarsk, Siberia route were over 2,600 Bell P-39 Aircobra fighters, nearly 2,400 Bell P-63 Kingcobra fighters, over 1,350 Douglas A-20 Boston/Havoc attack light bombers, over 730 North American Aviation B-25 Mitchell bombers, and over 700 Douglas C-47 Skytrain transports. Along with the aircraft, the United States would provide the Soviet war effort with nearly half a million vehicles, 2 million tons of fuel and nearly 4.5 million tons of food.